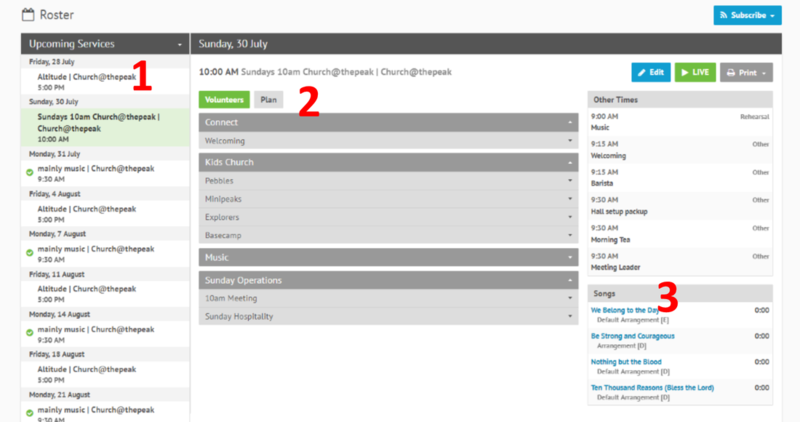 You will receive emails letting you know when you are rostered on to serve with Church@thepeak. You can look up rosters anytime on the Database or with the App. Elvanto will send you a reminder email 4 days before your scheduled service. If you can't attend your scheduled service, please arrange someone to swap with you. You can see other people who serve in the same role by viewing the volunteers in the Upcoming Services. Other people's contact details can be found in the member directory. When you have arranged your swap, email Jocelyn to let her know so she can change it in the roster. Please give the details of the dates that have been swapped. 1. List of services. 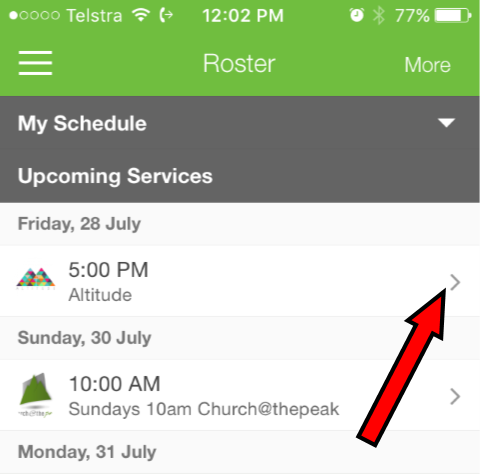 You have the option to view all upcoming services, or only those you are rostered on. More about this below. 2. Select a service from the list. You can then view all the volunteers (those who are rostered on). You can also view the service plan, if there is one. ​3. For the music team, songs are not in the plan but on the right hand side. To only view the services when you are rostered on, click the down arrow next to Upcoming Services and select My Schedule. Select the 3 lines in the top left-hand corner of your profile page. Click down arrow to view all Upcoming Services or only My Schedule (just the services when you are rostered on). 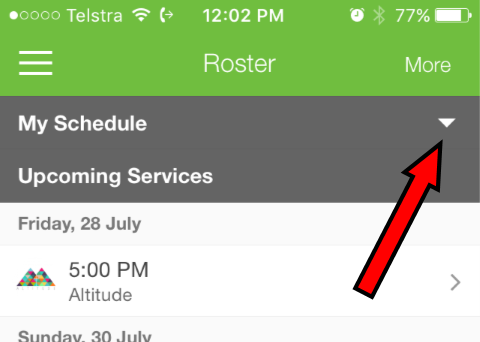 To view details of a service, tap the arrow on the right. To view details of volunteers, service plan, times etc. tap the arrow on the right.